Open Networked Learning is an interesting program to enhance our career in E-learning. Life indeed is a continuous process of learning, if you stop learning, it is just like you also stop living. I have been teaching for almost 15 years and experienced different teaching pedagogy in delivering my lessons, from using visual aids, posters and card boards to a sophisticated digital approach. Now, in the era of digital learning, I am very keen in using different tools that will help me design good materials for my students. Now that I was given a chance to participate in ONL151, I expect to learn a lot by collaborating with different people on their own field of expertise. Therefore, I am looking forward to learn more about Open Networked Learning and apply it in my profession. Being part of PBL Group 4 is a good experience since this is my first time to collaborate with other people online though I did not meet them before. We will be working together and expect to submit output from sharing ideas and skills. The first webinar in Open Networked Leaning last (ONL151) is a good start for me to be oriented about PBL (Problem Based Leaning) and FISH model. For a couple years in teaching, I have been practicing PBL and FISH but I am not just aware that these are the proper terms for those activities I have done. Therefore, I have research more about PBL to know it’s importance and proper application. Problem-based learning (PBL) is a student-centered pedagogy in which students learn about a subject through the experience of creating a problem. Students learn both thinking strategies and domain knowledge. PBL originated in the medical field because the teachers in the medical field felt that their students would benefit from real world situations instead of simply learning facts. In traditional learning set-up, we are told what we need to know thru listening and learning from the teacher in the classroom then memorize and apply the new knowledge in problems assigned to illustrate how to use it but in PBL,students are encourage to identify problems, discusses and decide on one particular problem to solve. Afterwards, the group begins to find facts that give some insight to the problem, brainstorms possible solutions and the teacher or a student representative records the ideas. Students discuss these ideas and expand on them. At this point the teacher can ask critical thinking questions that lead the students to analyze the situation and possible solutions more in-depth. 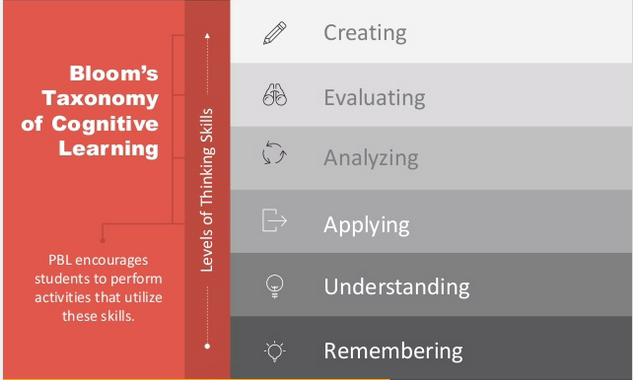 I can say that PBL pedagogy is better since it covers three domains of learning: cognitive, affective and psychomotor where the students develop higher order thinking skills. Therefore, PBL encourages students to develop higher thinking skills that makes the student achieve up to the highest level of Bloom’s Taxonomy of Cognitive Learning. Thru reading, hearing, viewing of images, watching videos, learn and collaborate with others makes PBL promotes self directive learning that ensures higher retention level of learning.